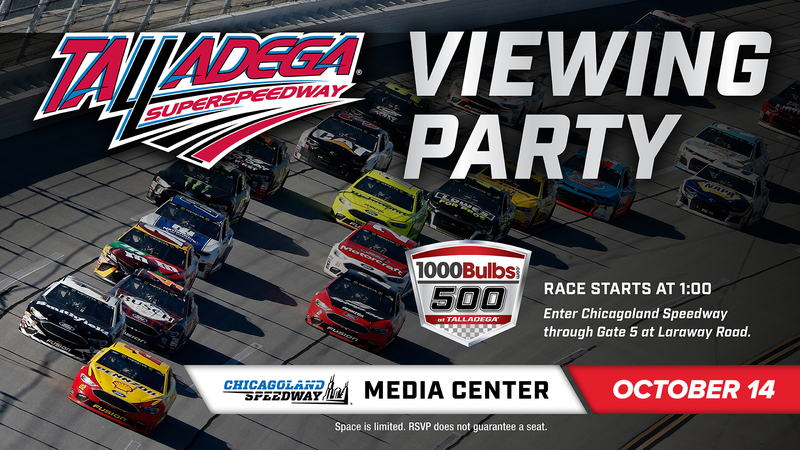 Please RSVP to the 1000bulbs.com 500 at Talladega Superspeedway Viewing Party on October 14, held in the Chicagoland Speedway media center on October 14. Chicagoland Speedway is offering track parade laps in your own car prior to the race. Guests will be able to take two laps around our 1.5-mile oval for a $20 donation to our R.A.C.E. Foundation per car, per trip. Gates open at 11 a.m., with race time scheduled for 1 p.m. CT. Cash bar will be provided as well as food options for purchase. Guests enter through Gate 5 off Laraway Rd. and will be directed the infield to park and/or for their pace lap. Please RSVP. However, RSVP does not guarantee a seat. Space is limited. Get here early!